Tricia Lewis, our Fashion Herald blogger, is out on maternity leave. Following is a post from her co-worker Catherine who is kindly filling in as guest blogger. Writing guest posts on Fashion Herald during Tricia's maternity leave has had its perks. It gets us out of the office, and we get to stroll around stores sampling everything you see here on the blog. Despite best efforts to look, not buy, there's always the chance of falling in love with something you've tried on. It happens. 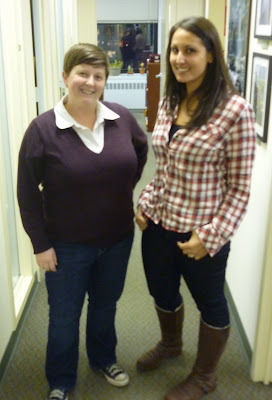 This week Katie and I both ended up wearing things we found while scouting 34th Street for Fashion Herald. Katie explored Gap's plaids last week and ended up purchasing a red & black plaid top the next day, and I waited until the sweater I tried on at Banana Republic a few months ago went on sale, then snatched it up. Thanks for having a baby, Tricia. Without you and Hazel, we may not have made these great new additions to our wardrobes. You two are adorable. I've sadly fallen down on my guest blogging duties.... sigh. Hazel, my wonder baby, helping out the economy and changing lives already! And WendyB, as if you didn't have enough blogging to do already?! But still, a girl can dream of WendyB and CFR shopping Jack's together!